By the sound of the title alone, you gotta figure it can’t be good, but if the information educates just one person or raises awareness, then it’s well worth the time to write. Simply put: pesticides kill. Not only do they kill the targeted species, but affected prey also becomes poison (and fatal) for predator as well. 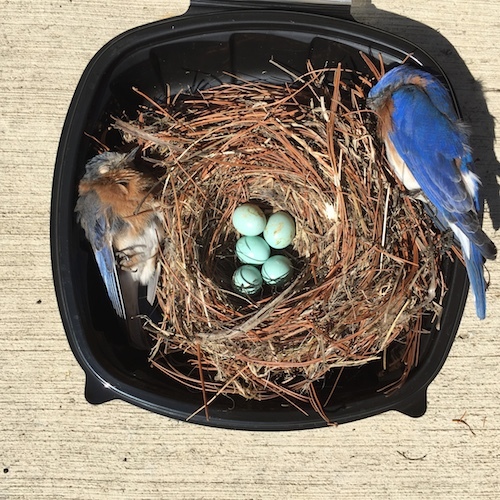 In a bluebird house along one monitor’s trail in a cemetery (yes, they’re great spots to host blues with open spaces and relatively limited activity) sat five eggs never to be incubated. Mom and dad who were healthy thriving parents were both found dead in the box, yet totally intact. This pair was actually banded and well known by local bluebird enthusiasts. How does this connect to bluebird houses and meal worms? Pesticides… in the form of worm-shaped pellets! Mole baits resemble mealworms and when used properly should be placed below ground in the mole runs. Due to the inadvertent misuse of this poison by a cemetery employee, a slow and painful death came for both parents. The incident occurred a few months ago. After the bait was carelessly disbursed, a sudden cold snap had the bluebirds believing these were worms. Paralyzed without a mark on them, both perished one day apart due to paralysis from the poison. 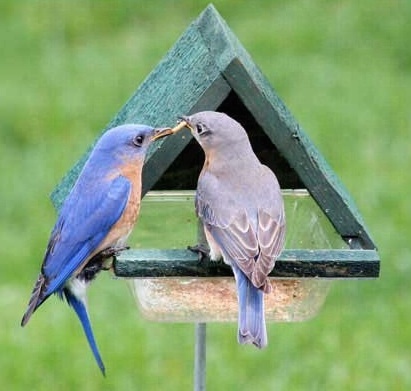 Both had gone back to the bluebird house with eggs for their final breaths. A bit dramatic? Maybe so, But step back and look at the big picture because in nature (and life) everything is connected. We’re killing ourselves, killing pollinators and killing Mother Earth. (this post was scheduled for Earth Day). Stop using pesticides and chemicals. Manicured lawns and gardens are passe, natural and rustic are in style! If you’re trying to attract hummingbirds, butterflies or bees for instance, do not treat or spray flowers from which they draw nectar. Please be aware and mindful to help nature thrive in your patch of green… it’s for your own good! Thanks Paula Z. of Ohio (dedicated bluebird monitor) for letting others know about this occurrence and use of the images. “Sad occurrence in lone box in Powell Cemetery. Both male and female EABL were killed by Talpirid mole bait. We had extended cold snap and snow and desperate to find food, almost certainly found some “worms”. Male found dead in nestbox on 4-13 by me. He was in good physical shape without a mark on him. Female was in tree making some noise when I got there (maybe in pain, who knows?). I removed him and left her 5 eggs there. Following day, my friend checked box and found her dead in there too. I contacted city to find they had put down mole bait worms – almost certainly they found them, ate them or fed them to each other… Sad. I removed box for several days because a new pair was there checking out box same day we removed dead female – hope worms are out of the ecosystem by now. City won’t use poison worms again; will trap if they need to kill moles. Rocking Accessories for Bird Baths! Some how we went from Mother’s Day… right to Father’s Day! Not exactly sure how that happened, but it’s good to be back! So many cool happenings in the bird world during May that we missed. Migratory birds on the move with all their splendid color, hummingbirds have landed just about everywhere, bluebirds on their second broods, and parents feeding fledglings everywhere to name just a few. A common thread among all these birds? Water! Here’s a few fun accessories that keep water moving to entice more birds. They beat boring bird baths ten times over, water stays fresher, and they cost nothing to just a few pennies per day to operate. Greatly improved, these are ideal for existing baths. The kits are longer-lasting, no fuss and have easier to clean pumps. The panels still require full sun to operate, but there’s options for a one-piece kit or separate panel. The latter allows the birdbath to be shaded while panel receives full sun (depending on your landscape). The smaller pumps are just as powerful, so when using the spray heads be sure water does not overshoot the bowl and drain it as the pump should not run dry. Sans attachments and you’ve got a bubbler for smaller or hanging baths. New for the season, the Splash Pool Bubbler is perfect for deck, patio or ground. The shallow splash area and overall height let birds bathe more naturally (at ground level). It works well atop a small table or plant stand too. An electric pump allows for continuous flow regardless of what the sun’s doing that day, and the large reservoir needn’t be filled as frequently. 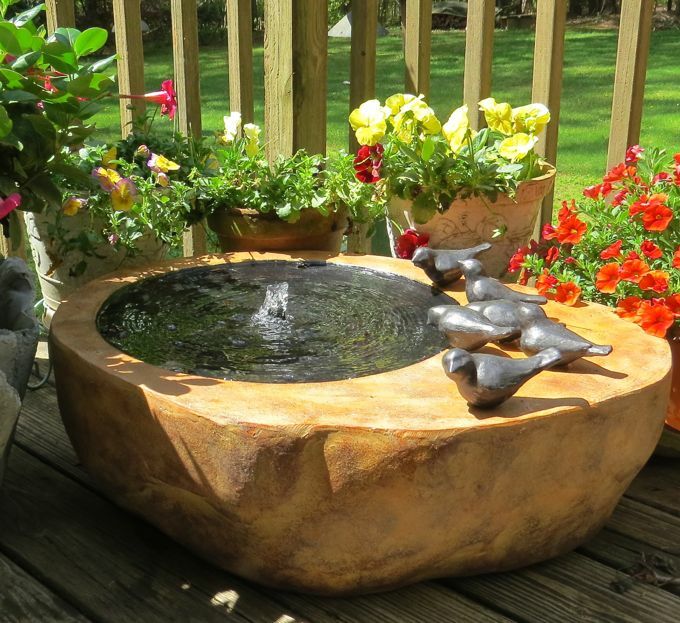 Natural stone finish and removable decorative birds make this bird bath totally fun for feathered friends and hosts alike! 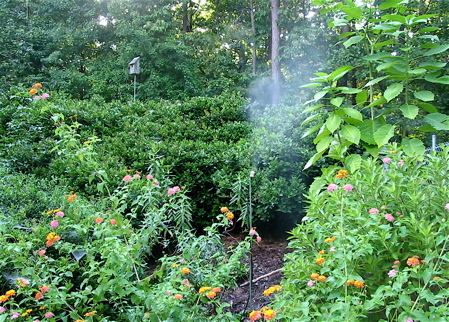 Possibly more exciting than bird baths, misters attract butterflies as well. Installation is versatile from a permanent set-up to a mobile one when attaching the tubing to a plant stake! Pick it up and move around the garden daily. This also prevents the ground from becoming too saturated in any one spot, and gardens grow lush! Songbirds will sit and wait for misters to start on hot summer days. Attaching to your outdoor spigot, the Y-valve frees up garden hose so there’s no switching connections. 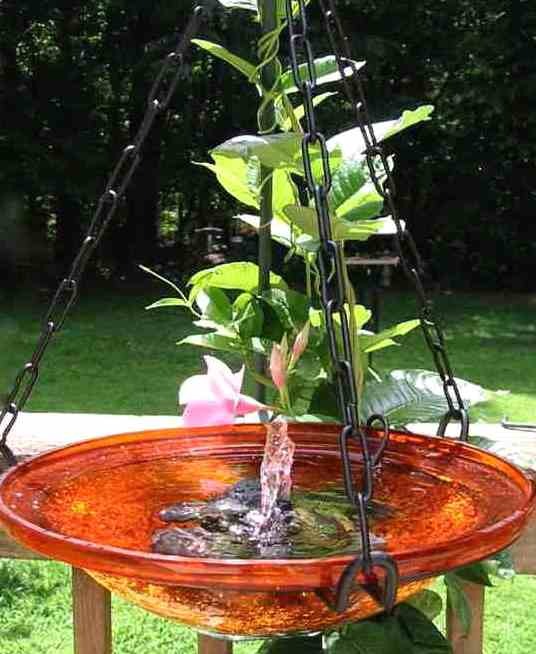 That still leaves bird bath drippers, water wigglers, and a DIY birdbath dripper you can make for next to zero cost (stay tuned for this article). 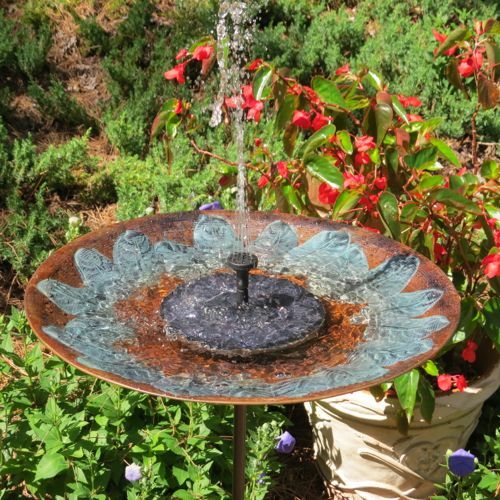 Add some moving water to your place and watch bird baths come alive with non-stop activity!